If you love mountains, get a different, up-close perspective of these ranges with off-road rentals and some of the best ATV trails in the area. From our location, you have access to many trails that lead into the mountains. From beginner trails to more experienced ATV trails, we can help you find one that fits the level of experience for both you and your family and friends. Our team of adventure enthusiasts know these trails in detail, so feel free to ask us any questions about the terrain or challenging sections of the trails. Pagosa Springs continues to be a great starting off point for ATV rentals and trails that can take you to wonderful views, hot springs, abandoned towns, and mountain lakes. Pagosa Springs means “healing waters,” gaining this nickname from the numerous natural hot springs that occur within the area. The area was originally inhabited by the Utes and the Navajos but was eventually taken over by the Spanish. More people came to the area by way of the Old Spanish Trail, which led to Pagosa Springs becoming a gold mining community. 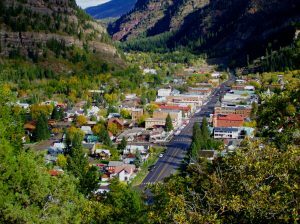 The town of Pagosa Springs was officially incorporated in 1891 when cattle ranching, lumber, and businesses began to open and eventually churches, blacksmiths, hotels, and schools followed suit. While you are experiencing our ATV rentals and trails, spend some time in the historic town as well. Because of our convenient location, you can take advantage of our overnight rentals and find a campground so that you can truly experience the backcountry of Colorado. Many of these campgrounds have drinking water, water access, campfire rings, and toilet facilities, making it easier to enjoy your off-road rental and time tucked away in the mountains. Utilize the overnight ATV rental so you can take a side trip to a hot spring off the Devil Mountain Loop Trail. With our larger six seat UTV, you have space to pack a tent and camping gear. You can always give us a call for more detailed directions. We can’t wait to hear from you. If you coming from the northeast end of colorado, take Highway 25 South and then head west on Highway 160, which will lead into Pagosa Springs. If you are coming from the south or New Mexico area, take Highway 550 north, take a right onto Highway 537 north, and then follow Highway 84 west. If you are coming from the west take Highway 491 east, take a left onto Highway 184, then finally Highway 160. At Pagosa Adventure Rentals, we want to share with you the best ATV trails in Colorado. With our off-road rentals and the knowledge that we have of the trails, you can be sure to have an adventure that is full of nature, wildlife, fantastic views, history, and more.